There are many things to look for when choosing an Orlando apartment. Where do you want to live? What kind of amenities do you want? What school districts are you interested in? Finding an apartment in Orlando can be overwhelming because there are so many places to look. But if you devise a plan and stick to it, finding an Orlando apartment can be a snap. Once you have considered all of these suggestions, you can use the filters provided in 407apartments Orlando apartment guide to narrow down your search! First, decide which Orlando neighborhood you want to call home. There are many diverse communities in Orlando. The downtown Orlando area offers the hustle and bustle of a large city with the charm of a Florida town. If you prefer something more laid-back, you could check out the Loch Haven Park area, Turkey Lake area, College Park area, or Hunter’s Creek community. Slightly outside of metro Orlando you will find Apopka, Oviedo, Winter Springs and Winter Park. And if you’re a student at UCF, there are many college apartments in Orlando. How much of your monthly income are you able to spend on an apartment? A quick rule of thumb is that your apartment rent should not exceed 30% of your montly household income. This can get tricky though, some apartments include utilities in the monthly rent, or services like cable and internet. This can change the scope of your budget. We suggest creating an Excel spreadsheet outlilning all of your current expenses to determine how much you should ideally be paying for rent. This process will take some extra time, but it will be worth it in the long run when you are able to set a max rent budget where you can live comfortably long-term. There are a few things to think about when you're selecting an Orlando apartment floor plan. How many people will be living in the apartment, and who is able to share a room? The typical rule for apartments is "2 heartbeats per bedroom," meaning that you should never plan to have more than 2 occupants per room. You may also want to consider getting an extra room if you have a hobby that requires extra space, have frequent guests visit that will require a private bedroom, or are expecting a new family member during your lease term. Rental rates can vastly vary by floor plan, so it is important that you determine your ideal floor plan at the start of your apartment search. The next thing you might want to consider is how long you plan to stay. Some apartment communities offer shorter lease lengths than others. If you need to be able to relocate within six months, you may want to only consider those apartments in Orlando which offer short lease terms. Depending on your lifestyle, transportation to and from your Orlando apartment may be very important. If you own a car, you'll want to know about parking availability. Does the apartment have a garage, a parking lot or street parking? And is the parking fee included in the rent or extra? Alternately, if you do not own a car, it is important to find out what Public Transportation options are available near each apartment in Orlando. If you have a pet, you will want to narrow down your Orlando apartment search to only those apartments which are pet friendly. And if you’re into sports and fitness, you may want to search Orlando apartments with fitness centers on location. Some apartments also have pools, basketball courts, racquetball courts, tanning beds, volleyball courts, hot tubs, tennis courts and even sand volleyball. If these awesome amenities in Orlando apartments are important to you, you should seek out apartments with cool amenities. 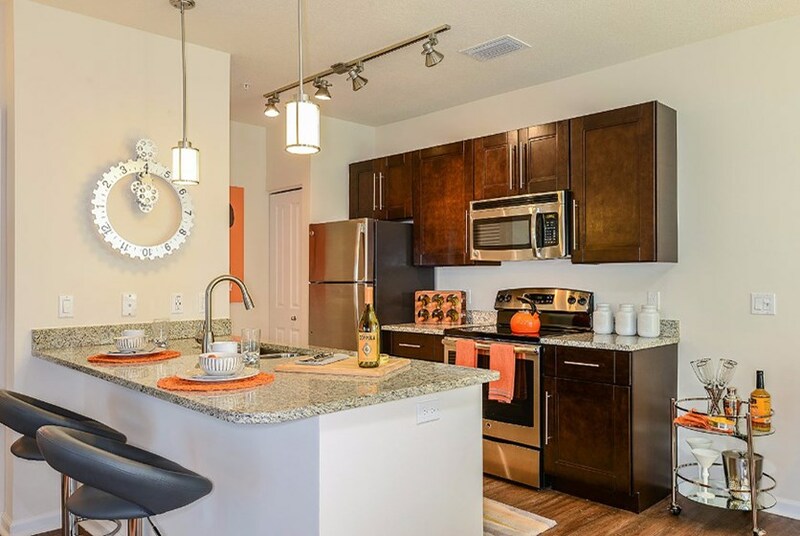 Which Orlando apartment features are most important to you? There are dozens of features you may want to look for when you search for your Orlando apartment. If you’re concerned about safety, you may look for apartments with alarm systems and gate security. Or you may be interested more in the aesthetics of the apartment. If so, you may want to search for an apartment with wood floors, ceiling fans, a balcony, patio, fireplace, loft, bay windows, vaulted ceilings, French doors, upgraded countertops or a walk-in closet. You can also narrow down your search by looking at the appliances available in Orlando apartments. For example, some Orlando apartments include a microwave, washer and dryer, central air, dishwasher, refrigerator, garbage disposal, or even a TV. But other apartments require you to bring your own appliances. There are some Green apartments in Orlando. These are apartments which offer recycling, low energy lighting, community gardens, tankless water heaters, native landscaping and are LEED Certified. If a Green apartment in Orlando is important to you, you should search for Orlando apartments that are environmentally friendly. If you’re looking for an unfurnished apartment in Orlando or a furnished apartment in Orlando, you have many options. Some apartments come partially furnished as well. And you should look into the available utilities when searching for an Orlando apartment. Some include cable, satellite, internet, water, electric, gas or local phone in your rent. Other apartments don’t. And if you’re looking for student apartments in Orlando, you will have the option of getting individual leases or joint leases. Student housing is available on campus or off campus and some offer roommate matching for Orlando apartments.